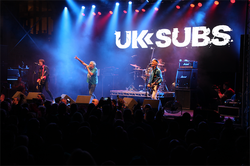 Long-running punk band UK Subs is set to release SubVerions, their first covers album in their now 42-year career. The record, wihich features covers of MC5, David Bowie, Bob Seger, Motorhead, and Queens of the Stone Age, will release on June 22 on Cleopatra Records. Their take on MC5's "Kick Out the Jams" is streaming now at New Noise.